Pecorino Toscano - Fresco DOP - Il Fiorino - Zuercher & Co.
Each wheel weighs only 2 kilograms (about 4.4 pounds) and is aged for a minimum of 20 days. The texture of the paste is fairly toothy considering its age, but melts nicely on the tongue upon warming. However, the thing that really stands out about the cheese is its lingering flavor. There is a fresh, milky flavor that evolves into notes of fresh hay, hazelnuts and faint minerality. On the sides of your tongue, you can pick up a balanced citrusy tang. 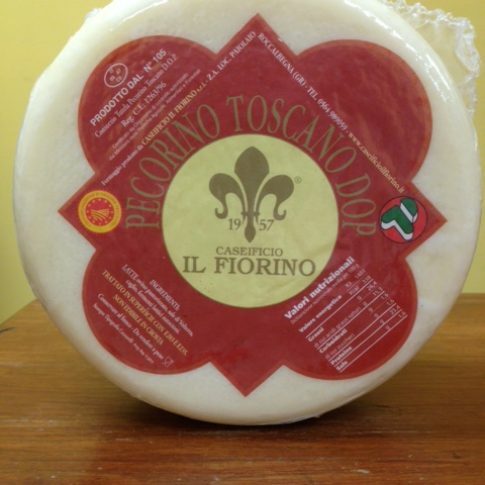 Serve Pecorino Toscano Fresco simply; a light salad, a bit of cheese and bread is all you need for a delicious lunch. Well, maybe one thing is missing…wine, of course! White wines fare best with this younger cheese. If you want to stay within the Tuscan vein, a crisp Vernaccia di San Gimignano, with a decent amount of minerality, will pair well. If you prefer something with a little more body, try an Orvieto Classico; its bright acidity is rounded out by the fruit-forward, floral characteristics of this blend.